find it difficult to describe, I usually start with what it looks like when people ask. At low tide, the gray mudflats extend to the river’s channel where the brownish water ­gently recedes with the ebb. Across the bay the water meets the mountains, providing the ­perfect canvas for a sunset. Behind the cabins on Nushagak point, a verdant hill stretches along the beach. Over the hill, the landscape changes to miles of green, vast tundra. “It’s a beautiful place,” I say. This is not difficult for people to understand. It is not as though they know what I’m describing, but, rather, they know the feeling and appreciation for their own beautiful place. From there, I launch into the fishing itself because if I leave out the complicated bits, it is also straightforward. I explain that we usually switch crews at high tides, meaning that it’s twelve hours on and twelve hours off. I say that we use aluminum skiffs to work our nets that we keep wet by moving with the tide. The goal is to catch as many salmon as possible. Usually this means sockeye (also known as reds) that we sell to a tender, or a bigger boat hired by the cannery that buys our fish. “But what do you actually do?” they say. Pebble Mine is a proposed copper mine that would dig the largest open-pit in North America at the head of the river system in Bristol Bay, threatening a multitude of ecosystems. Anti-pebble paraphernalia can be found in every shape and form in the bay (above); the crew relaxes after a long day of work (below); A fishcamp friend, Megan, cuts up a fish for a â&#x20AC;&#x153;Yukon-styleâ&#x20AC;? smoke. The filets remain attached at the tail and hang to dry after a quick stint in a smoker (across). This is what makes this place beautiful: a simple reality, with good company and unforgettable views. places. It is a feeling of reality and simplicity. Everywhere else, this is a gross oxymoron. Fishing is not simple, but when I’m fishing I feel simple. I live simply. Yes, I also feel removed from some people and things I love—like the sunny beaches of my hometown, my family, my friends, and that summertime feeling that there is nothing else that needs to be done and no worry that the fish will show six hours after you get in from a sixteen-hour shift. My summers are different when I spend them at home. an attempt to mobilize the middle class. Azit Bayit is perhaps the strongest example of this school of thought. An urban planning initiative brought to Israel during the Second Aliyah, its constituency sought to form a Hebrew urban center in a healthy environment, planned according to the rules of aesthetics and modern hygiene. That city became Tel Aviv. great frustration. It has long become obsolete in America, which has recently dethroned Israel for the title of “largest Jewish population.” In Israel, it can be detected only under close analysis, having been replaced by a much more narrow, almost culturally xenophobic worldview. Beyond a multi-linguist, Saba is also a virtual historical encyclopedia. Perhaps one of my favorite elements of my grandfather’s worldview and its zeitgeist that incubated it is his great respect for history. Out this outlook comes an honest and unpretentious understanding of the development of civilization, the major forces that drive man to create, and the human condition as a whole. When I was younger, I would brag to all my friends that my grandfather could discuss, at length, any historical event to have taken place within the past three thousand years. Having served as a diplomat in Scandinavia, he most recently recounted to me in detail the secret transfer of Danish Jews to Sweden, unbeknownst to the Swedes, to keep them safe from deportation from the Nazi-occupied Denmark to the extermination camps in Poland. in architecture, the city must seem an enigma: buildings crafted from a distinctively German ideal on the Mediterranean coast, housing a mix of Semitic peoples. In the linguistic dilemma, my grandfather subtly seems to favor French, his favorite language. He met my grandmother when he worked as her French tutor in the Alliance French-Israeli high school. Later, after his military service, Arie got a scholarship to study in Paris, where my grandmother joined him. They got married, and my father was born there. French language and culture became part of their life, and they often speak French today and listen to a wealth of French music. I inherited from them a love for Edith Piaf, Jacques Brel, Serge Gainsbourg and the chansons of the 1950s. He attended Piaf ’s final concert in Paris in 1963, further contributing to my childhood, and current, marvel at his life. On this particular trip, he also presented to my family his translation of an Umberto Eco novel from Italian to Hebrew. t half past four in the afternoon, I finally arrived at Olney Hill Road, the dirt turnoff to Geordie Lynd’s farm outside of Cabot, Vermont. until a cluster of buildings, tractors, and animals appeared at the very top. A twostory farmhouse, a partially renovated stained barn and a run-down red garage with a tractor parked outside made a triangle around a small plot of land. He paused for a second as he detached the milking machine from a cow to bring to the next one. “So what’s the music scene in New England now? Is there a community you play with?” “It’s still a big part of these communities, especially contra dances. And I have several people I regularly play with: some live in the area, others I’ve known for ten or twelve years since I started. A lot of fiddlers are in-house bands for contra dances or pubs, and those groups play with each other on their own a lot too. Sometimes I’ll drop in on jams like those in someone’s living room, those are fun.” At about eight o’clock, Geordie and Emory finished their chores, and we walked back into the house. On the way, I stopped to get my violin out of the trunk of the car, hoping to play some tunes with Geordie. When I entered the house Geordie sat with Emory around the oak table in the middle of the room tuning up his fiddle. His violin was made out of a pale spruce and he clearly took care of it, except for the strings caked with white rosin dust from his bow, which I knew would tarnish the finish on the wood if he didn’t rub it off. The fiddle and the violin are the same instrument; technique gives each its identity. “Why don’t you play him something, hun?” Emory asked. land, and my home, is perhaps one of the most untouched wildernesses left on our planet and remains largely unknown. I remember the first time my eyes caught a glimpse of this mysterious, reed-shrouded wilderness. I was about two-feet tall and sat with my nose glued to the window of the minute chartered airplane. The only way to get into the heart of the delta is with these flimsy planes that whirr through the air like manmade mosquitoes. These miniature planes only reaffirm the immensity of the Okavango. And yet, despite the vastness of the delta, what struck me the most were the tiny mysteries which, heightened by my childâ&#x20AC;&#x2122;s eyes, became wonders. Clearly, the Delta is a deeply important and essential biodiversity area and as such, should be called the heart of sub-Saharan Africa. And yet, the Delta is, unbelievably, not a UNESCO World Heritage Site and so is, as of yet, unprotected. However, if the Delta were named a UNESCO World Heritage site, then any potential problems or damages to the site would be thwarted and the hidden world would remain protected for generations. We shall find out if the Delta reaches World Heritage Status come 2014. In the mean time, open your eyes to one of Africa’s greatest treasures. Realize that beauty and nature like the Okavango delta need to be protected, because they are the remaining wonders in our world. So, take the time to look closer at the spaces inbetween the reeds and perhaps you might find your metaphorical reed-frog somewhere – an incredible beauty which returns you to a state of child-like wonder, because in the end, life is simply dull without the acknowledgement of beauty. farming has become individualistic and competitive. The popularization of television additionally served to reinforce this individualistic lifestyle. Spaces that farmers had created to connect with each other slowly disappeared, as nights playing card games at each other’s house were replaced by evenings watching television. Similarly, the decline of church attendance meant that farmers had less opportunity to converse and connect. In Dordogne, we have gone from more priests than churches, to more churches than priests. And that is not all. In the 1950s, there were four agricultural shows in Le Bugue, a nearby town. Farmers from all over the region congregated in the day to sell products and livestock and in the light to go to the bar, discuss local issues. My neighbor Monsieur Fort puts it like this: “It was an opportunity for the Jacque and for the Paul to catch up on each other’s life.” This opportunity no longer exists: an annual motorbike show, frequented largely by tourists, replaced it. Some tourists like the Dordogne so much that they decide to buy property in the region and renovate or build a new house. Their contribution to the space’s identity often conflicts with the farmers’ more tradition vision. place already embedded in it: kai in Hawaiian means water and e’lua means two. The two waters are the Pacific Ocean and Ka’elepulu pond. Nowhere in Kailua is farther than a couple of miles from water. When asked about my island roots I get frustrated because it’s hard for me to sum up a place so complicated in just a few sentences. It’s true, Hawa’ii is an extremely beautiful place, but it is also a place where people live, die, work, and yes, even commit crimes. The 50th state is in these ways often forgotten, something the residents both love and hate. Moving past the surfacelevel understanding of Hawa’ii, we focus on the residential beach town, Kailua. Kailua lies on what locals call the winward or the East side of O’ahu. Mainly constructed of nice suburbs, a neighborhood in Kailua is similar to those in the continental United States. But like most things in Kailua, mainstream American culture doesn’t last long as it is tweaked to the locals liking. The suburbs are no exception, their distinctly 70’s architecture reflects American culture, yet not quite as they are outdated and almost rundown from the heavy weathering salt air has on houses. Outdoor showers to wash off sand, plumeria trees in the front yard, and the rust found on all houses add to what distinguishes as house in Kailua from anywhere else. The beach’s white soft sands and clear blue waters with mild surf make the beach a perfect communal space. by outsiders. Residents of Kailua echoed this view; when interviewed they spoke of how Target “won’t have the same community feel.” Another person saying “[Kailua is] very touristy,” and “Kailua’s changed a lot. It’s become more like the mainland or Waikiki”. While the individual interviewed does not explicitly say that the mainland and Waikiki are negative places, he recognizes how Kailua is becoming more like those places and this change is viewed as negative. The people of Kailua take pride in the fact that Kailua is separate and different from Waikiki. Having lived in Kailua my whole life, I think of the two as distinctly separate and had to be reminded when looking at the map that Waikiki was just 12 miles from downtown Kailua. The Ko’olau Mountains, which physically stand between these two towns, help the people imagine the distance as much greater, as one cannot see one place from the other. The mountains help to solidify the Kailua identity, and make Kailua distinctly windward, and Waikiki distinctly leeward. As a whole, the people of Kailua resent their proximity to Waikiki and affiliation with the United States or as locals say, the “mainland”, playing upon the physical separation of the two places in order to further a separate identity. The people of Kailua protested the construction of a new Target because to them it is a physical representation of their own identity changing. ; a physical representation of mainland influence which one woman simply put “just doesn’t belong here”. This resistance of exterior influence can make Kailua seem like an anti-American place, as the people do not subscribe or particularly like traditional American culture. I argue however, that Kailua is an example of a “new” American place, one that is not solely American, but a blend of American and the diverse culture of Hawa’ii. Although I like to think of Kailua as unique, I know there are thousands of other unique towns all over the United States, places just like Kailua, while not traditional; they constitute “new” American places. with the pale walls of the exhibition. I’m standing on the fourth floor of the Georgian National Museum in Tblisi, in a permanent exhibition also known as the Museum of Soviet Occupation. drove off to last night. He drove back to the flock of sheep on the roadside, where he and the farmer slit the throat of one of the lamps before bundling the carcass into a translucent plastic bag. I know it was a translucent plastic bag because it is now sitting under my seat. Will, our coordinator, chastises us for missing such an essentially Georgian experience. I sit in in the van with the windows that refuse to budge, overdramatically coughing in a passiveaggressive attempt to get Father Ilya to stop smoking. With every twist and turn in the road, the headless carcass of the lamb bumps into the back of my ankles. *** Father Ilya doesn’t understand why we want to visit Gori, Stalin’s birthplace. Surely we would rather see more monasteries instead? Having politely declined a tour of our eighth and ninth monasteries in two days, we set off for Gori. The museum is a relic, a veritable shrine to Stalin that the government has halfheartedly attempted to convert into a memorial to the victims of the Stalinist era. The converted museum will reopen in 2009, a sign reads. Well, it’s May of 2012 and not much as changed. Our tour leads us through rooms filled with paintings of Stalin, his personal possessions. We file silently through a round room, hushed as if paying homage to the bust of Stalin at its center. Our silence feels complicit. There is still a sense of pride among the residents of Gori, pride accompanied by a sort of selective amnesia of Stalin’s forced deportations, show trials and labor camps. Perhaps it is less a selective amnesia and more of an inability to overcome years of a cult of personality that cast Stalin as the father of a nation. Later that year, back in the U.S., I read in the New York Times that Gori’s municipal council has voted to reinstate a monument to Stalin in the town center. I think of the rooms in the museum, frozen in time. *** The houses along the main street in Gori are pockmarked, providing a reminder of the shelling that threatened residents in the 2008 South Ossetian Crisis. Tanks rolled down the main street when Russian forces invaded as far south as Gori. beckon just as new office buildings stretch the city to the northwest. It’s impossible to think of Georgia only in the context of its identity as a former Soviet republic. Yet I find myself looking for the connections to what I know, what I’ve studied. *** These hills, these mountains remain unchanged. Monasteries watch over each valley and village as they have done for centuries. But he people of these mountains and valleys have not evaded the ebb and flow of history over their landscape. I am overwhelmed by all that I do not know, by a land and a people that have lived the history I read about. Everything I thought I knew, I read in a history book. Well, maybe I watched a documentary or two. In Georgia I reach out to touch history. I taste it and hear it and speak it. Now it’s real for me, too. But no matter how many new Russian words I learn, I understand little more than I ever have. 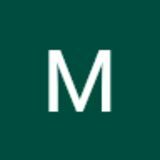 J o i n t h e a d v en t u r e If you are interested in submitting writing or photography to Middlebury Â­Geographic or in being part of the magazineâ&#x20AC;&#x2122;s editing team, please contact us at mg@middlebury.edu. Every issue of Middlebury Geographic is available at go.middlebury.edu/mg. 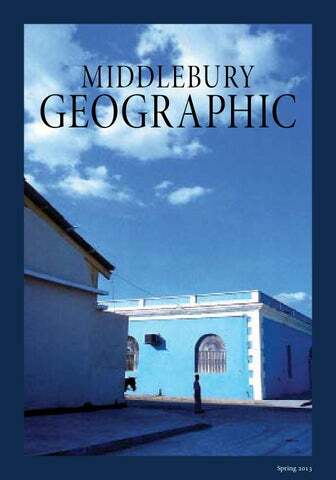 Middlebury Geographic's Spring 2013 publication.